The Christ in Prophecy Journal: Questions From Non-Believers: Only One Way to Heaven? Is there only just one way to Heaven? Dr. David Reagan and I on our ministry's television show Christ in Prophecy had the pleasure of asking this question of Eric Barger of Take a Stand! Ministries. Eric is an authority on the cults, the New Age, and rock music today. From his past as a former drug addict and rock n' roll musician who was deeply involved in the New Age movement, Eric has emerged since he gave his life to Jesus Christ to become a great defender of Christianity in America. He joined us to answer the most frequently asked questions by non-Christians about the Bible and Christianity. Dr. Reagan: Let's talk about the accusation that Christians are just too narrow minded and they aren't tolerant enough because we believe Jesus is the only way to Heaven as John 14:6 and other passages teach. We live in an age of tolerance where we should embrace and love everybodies ideas and believe that your opinion is just as good as my opinion. Even among so called evangelicals today, there are some saying there's not really any absolute truth and that your truth is as good as my truth. Is this true? Eric Barger: Did you call me narrow minded? If you did, praise the Lord, Brother! You've got it. Dr. Reagan: Jesus must have been pretty narrow minded, for as He said many times, there is no road to God except through Him. Eric Barger: Jesus didn't say "me and Buddha," or that "Confucius is the way, the truth and the life." No, Jesus stated very clearly in John 14:6, "I am the way and the truth and the life. No one comes to the Father except through me." Jesus is the key. As Christians we certainly want to be conciliatory and we want to be loving and we want to reach out to people. In the process, though, we can't let the values and the doctrinal beliefs that the Scriptures teach us to be let go by and by. And yet, that's exactly what's happened to the Church. This loss of belief in Christ alone is happening in evangelical circles, exactly like it did 100 to 150 years ago with those who used to be the Evangelicals but whom now today we call Liberals. When I say Liberals, I'm not talking politics. Instead, I'm talking about those who claim to be Christians but don't really believe what the Gospels teach. Dr. Reagan: The fastest growing belief in Christendom today all across the board and in all denominations is the idea that there are many different roads to God. Let's keep discussing that. Nathan Jones: We then have got to look at the people who are claiming tolerance and are saying all roads lead to God. Usually, to be truthful, they don't really believe in anything. They are the most tolerant because they don't have any true faith by which they believe by, so they are just kind of hoping that whatever belief one has eventually all leads to somewhere. They have an agnostic, general view that there's some God out there, and wish hopefully they'll be going to Heaven one day just so they've got their bases covered. Dr. Reagan: It seems to me like when they're saying that and they are claiming to be Christians, though, what they're basically doing is loving cults like the Mormons and unbiblical religions like the Hindus and Muslims right into Hell. Nathan Jones: This shows they're very confused about their belief in Christ, too. They really don't believe in Jesus, so they have to say all these other religions' prophets are right as well. When we are called "narrow minded," that indeed is a compliment like Eric said, because what we are saying is the claim of Jesus being the only way to Heaven doesn't originate in us. In reality, this comes from God in His Word. God is the One who says that He sent His Son to die for our sins, and that if we believe in Jesus as the Son of God and Savior, we will be saved. God is giving us a life preserver. He is throwing mankind a lifeline. Praise the Lord we've even got a life preserver! So, we need to grab it and hold onto it with all our might, and be rescued from eternal death. With our eternal fate at stake, we can't be swimming out in the ocean of sin only to have God throw us a life preserver and then we push it away saying, "Oh, no, no, send us a green one." Or, "Send us a square one." Or, "I'll just swim forever." There's no choice in the matter. That doesn't work. No, instead, praise the Lord that we've even got a God who wants us to be saved and gives us the means by which we can be saved — faith in Jesus' saving work on the cross. Dr. Reagan: Eric, what do you have to say about the claim of there being many roads to God? Eric Barger: In the Church today we have something called Reconciling Universalism which believes or teaches that when Jesus went to the cross He died for the sins of the whole world, which the Bible says, but that everybody is now saved without faith. Not true, though. Hebrews 11:6 says you have got to have faith to please God. Reconciling Universalists take parts of Scripture out of context and falsely teach that everybody is going to be saved in the end. Dr. Reagan: They sort of ignore that Jesus said in Matthew 7:13 that the road to Hell is very wide, and the one that's proper is very narrow. Eric Barger: They do purposefully forget Matthew 7:13-15. Right on the spot! Jesus said concerning the proverbial entrance to Heaven that there is a narrow gate and a wide gate. Reconciling Universalism is the kind of universalism that I see Christians expose to more often than not. They need to be aware that when Jesus said He was the only way to the Father that was because He loves people. Jesus didn't proclaim exclusivity just because He wanted to give us something to buttress an argument or so we could beat somebody up with the truth. This isn't about us being right or winning an argument with an Atheist or a New Ager or whomever. No, this is about trying to explain to people what the Bible says so that then they can consider the claims of who Jesus is and what He sacrificed so they can consider Him as Savior and Lord. Dr. Reagan: I always think about the Ten Commandments and how God gave those for the purpose of helping us to have a very fulfilled life. And yet, people tend to look upon those rules as coming from some kind of arbitrary God who is just trying to keep them from having fun claiming, "I want to be free. I want to do what I want to do." But, what do they do? They go out and get hooked on drugs. How free are they really? Eric Barger: Not free at all. I for one remember. I know what being a slave to drugs is like. Nathan Jones: Isn't it sad that the heart is so desperately wicked? I think the basis of this view that we need to tolerate and embrace everyone's sin and we're all going to Heaven and there is no judgment is because people actually want to be sinful. We want to live out our sinful desires. And so, we come up with all these philosophies that will support our desire to rebel against God. 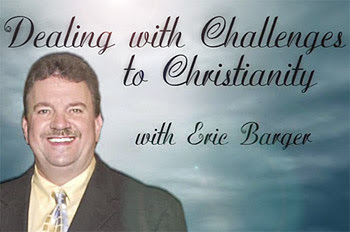 Eric Barger: If there was anything I'd say to someone who is examining Christianity and trying to figure out if it's THE way, go and examine the claims of Jesus Christ. Don't base your studies on the teachings of any particular church, but examine who Jesus said He was. Examine what happened to the disciples, especially the despair they showed when Jesus died. Look at the way Peter cowered the night before the Crucifixion, and then look at the resurrection power that was visited upon them afterwards. That's what Jesus does for people. He changes lives. He changed us sitting here. We weren't born Christians. We might have come from Christian homes or homes that had other Christians in it, but we weren't born that way. We came to Christ based on what He did on the cross for us and His claims of being one with Father God. That's what we're trying to get people to see, not just that we're so right and they're so wrong, but what the Bible teaches concerning all of our eternal destinies. In the fourth segment of this series concerning common questions from non-believers, we'll tackle the question, "Who really is Jesus Christ?"